Stay safe at your place of business with this Photo ID Card Name Badge. Stay safe at your work place with these Photo ID Card Name Badges. 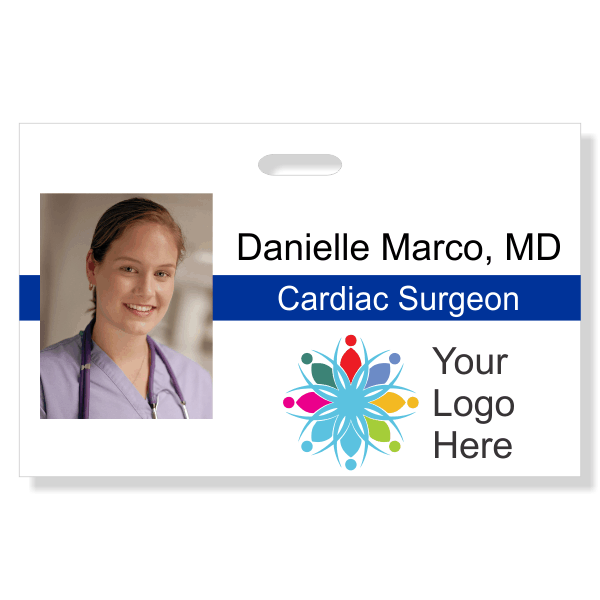 Made just the way you like them, these name tags are precisely what your staffing needs! We’re so pleased that you decide to order your new custom name tags from our humble factories us here at Name Tag Wizard! Like you, we dedicate ourselves to treating our clients to the best service that we can manage. Buy your new name tags for your staff now! Photo id badge produced on pvc plastic and printed in full-color high quality digital output. Simple, clean design features your photo on the left and your name/title above your logo on the right. Your choice of colored stripe and attachment style. Size: 3.375" x 2.125"